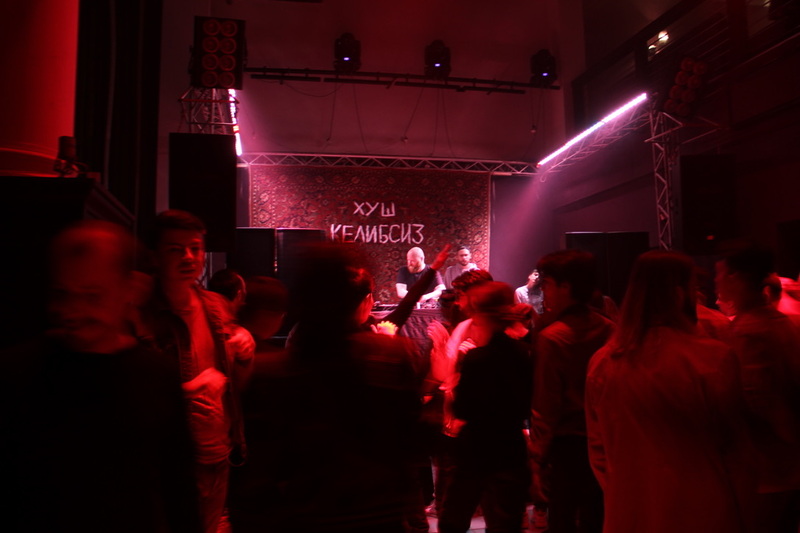 The throbbing electronic music emanating from Tashkent’s KtKomba club made for an odd contrast with the bucolic calcite-green stream burbling past. Inside, hundreds of young people danced through the night at an event the likes of which Uzbekistan rarely sees. It was as much a greeting to the party, which took place on March 23, as to what organizers from the Fragment collective hope was the dawn of a reenergized club culture. Fragment, a group of five local DJs, has been working tirelessly since they formed in August to – as they put it – give local people a taste of freedom through dance. Aleksandr Mekhonosh, who performs under the stage-name Shilo, was appalled to find such little life in Uzbekistan’s capital went he returned in 2016 after living and deejaying in Dubai. Fragment’s first major initiative was Stihia, a festival held on what used to be the shores of the Aral Sea. They have since been holding parties at Tashkent’s Sila bar, a place that event-organizers call a haven from the often-conservative strictures of Uzbek society. “As a person who lives in this city, I don’t see enough options. I want my friends to come from abroad and feel comfortable. And for the locals to feel the same. We’re building a modern country,” said Yury Khodjayev, who goes by the moniker SHMN onstage. The night at KtKomba was intended as a breakthrough. KtKomba is a little piece of Tashkent party history. In the early 2000s, it blazed the trail in bringing club culture to the city. It was the first venue in Uzbekistan with a western-style dress code, face control and go-go dancers. It helped that the owner was Lola Karimova, a wealthy daughter of the late president, Islam Karimov. No expense was spared fitting the finest sound equipment and lights. The priority was not to turn a profit, but to create a venue where clubbers could be themselves. World-famous acts like Busta Rhymes and David Guetta performed there. The venue’s summer room was lined with tapchans – the kind of raised seating platforms one sees all over Central Asia – with a view over a waterfall. There, partygoers would relax as they waited for the sun to rise. With time, KtKomba changed, as did its clientele. In 2011, it closed and then reopened as a larger venue able to accommodate 700 people. Crowds still turned out and international DJs sometimes played, but the club lost its original character. The sunrise-watching spot was transformed into Le Terrace, an expensive restaurant, where former clubbers – now grown-up professionals – would come to dine out of sheer nostalgia. The restaurant folded in 2018. When KtKomba itself closed in 2016, it left a vacuum in the nightlife scene. The Fragment collective hopes it can now take over where KtKomba left off. Holding their event there felt like a passing of the baton. The Fragment crowd are uncertain about KtKomba’s future, but they are hopeful the space does not lie idle. As for Fragment, what awaits is more events at the Sila bar and another edition of the Stihia festival, which should happen in August. Khodjayev is about to launch his own music program on a local radio station. Followers sense this is the beginning of something new. Agnieszka Pikulicka-Wilczewska is a freelance journalist covering the post-Soviet space. Sign up for Eurasianet's free weekly newsletter.